Amanda has a Bachelor of Arts in political science and is passionate about delivering high levels of service to her customers and teammates. She grew up in Canada, stays busy with her daughters and husband outside of work and is an avid hockey fan. 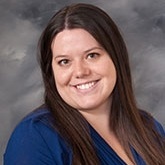 Since coming to the agency in 2010, Amanda has developed specialties in farm and ranch products, small to mid-size business policies, professional liability, cyber coverage, homeowners associations, contractors and lessor risk’s building coverage. She enjoys working on complicated accounts, is very organized, and loves new challenges.